[METHOD] Make money from Facebook - New way! Discussion in 'Making Money' started by avi619, Apr 26, 2013. This method can be used to gain some quick traffic to your website and can also be used to increase your page likes. Some facebook accounts (20 should be good). A bot or imacro to automate the method in future. Basically what we will be doing is make use of "facebook comments"
Recently facebook changed the layout of comments on pages as a conversation type, i.e, fans can now reply to each other directly in the comments and the most liked comments are pushed to the top of other comments. Say a page has 200K likes. Its average reach per post is 20K-30K. It gets around 700-1000 likes and 50-100 comments per post. So, if your comment is rated on top, you can expect many clicks on it. 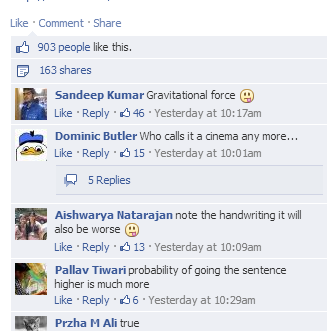 See, the comments with most likes are on top. - Make a good comment. - Include your link in it. - Rate it with other accounts and profit. Make sure you spin the content and use url shorteners in order to avoid comments being marked as spam. 2) Build email list in your niche. 3) Tag your page and get likes. 4) Put your own twist. Dude, if he wanted to show his niche or expose something, how would have shown his one in the images. What don't you take the idea and DIY. Think and implement your own twists, you should be good. He cab't spoon feed everyone, or he will be feedup and would have released a WSO. Yeah, I was thinking to automate this stuff too. Good luck. No one will spoonfeed you here. Why don't you start off with dating niche and promote easy dating email submits. Nice way of thinking outside of the box OP. I see that they're working their comments similar to yt. Yes its similar to YT, and can be used to bank hard as no one is actually exploiting this thing right now. Not only YT?! now FB! Nice method .If you search for pages with graph search you can even target pages and people. This is a very good method guys.i followed the GST thread on hiw to get facebook fanpages in any niche.http://www.blackhatworld.com/blackhat-seo/facebook/358991-how-buy-facebook-pages-super-cheap-2013-update-still-works.html.i saw a fanpage with 50,000 fans /600 talking.i posted on one good comment and linked them to my fanpage.the result.my brandnew fanpage got 103 likes same morning.theres gold in that GST thread and tgis one combined.so lets get to work bhw. its possible to do the job with a app, i can develope one but you guys have to add the accounts by your own if you wish !!! Tnks for the share, bro. Ok, show starts now ! - Thanks buddy.